That is really simple. I'm sure my fiance would love these while he watches the Alabama games. Yum! 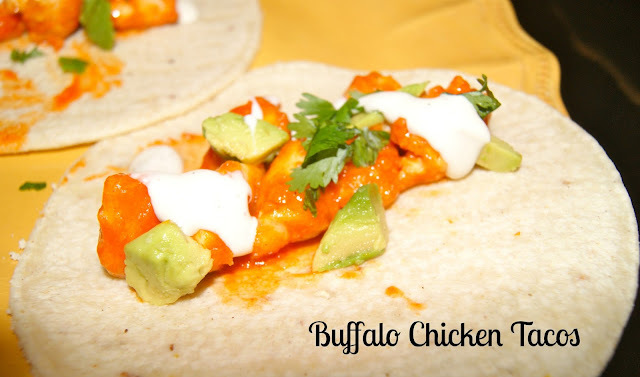 Love buffalo chicken anything and of course love tacos so this is a great combination! Thank goodness for football season...an excuse to eat delicious food all the time! These look soooo yummy! I love the avocado added to anything! Thanks for sharing this! Those look soo yummy! I loveeee buffalo chicken AND football! I love buffalo anything and tacos so perfect combo! Ok, I love tacos. And I love hot sauce. So, this is a natural win! ohhh these look so yummy! I LOVE buffalo! Must try these out this week!! I found your blog on the Meet and Greet Bloghop! Following you on bloglovin now :) Would love if you checked out my blog too! These sound so good and David would love them!! Def going to make these in the future! UM YUMMO! Might need to make these one night this week! We love buffalo wings, why not these?! This looks so good!!!! I love buffalo chicken!! Adding to my recipes to make list! PS: I posted the jalapeno grilled cheese sandwich :) you'll have to check it out! Yum yum yum! Looks delish! Pinned these for my hubby, who loves Buffalo Chicken. Thanks so much for sharing at the PinCentive Blog Hop today!! Anything with buffalo chicken is amazing!! These look yummy!